The digi image from Clear Dollar Stamp I used is called Autumn Critters and the owl is so cute. I resized the owl in Photoshop and removed the leaves on one of the images and pieced 3 owls together to fit one branch. I decided to use one color for each owl on my inspirational card here. Just to make something different I colored only the feather part of the owl and used black enamel for the eyes. Please visit Lily Pad Cards for more details and for a chance to win a great prize from our sponsor Clear Dollar Stamps. 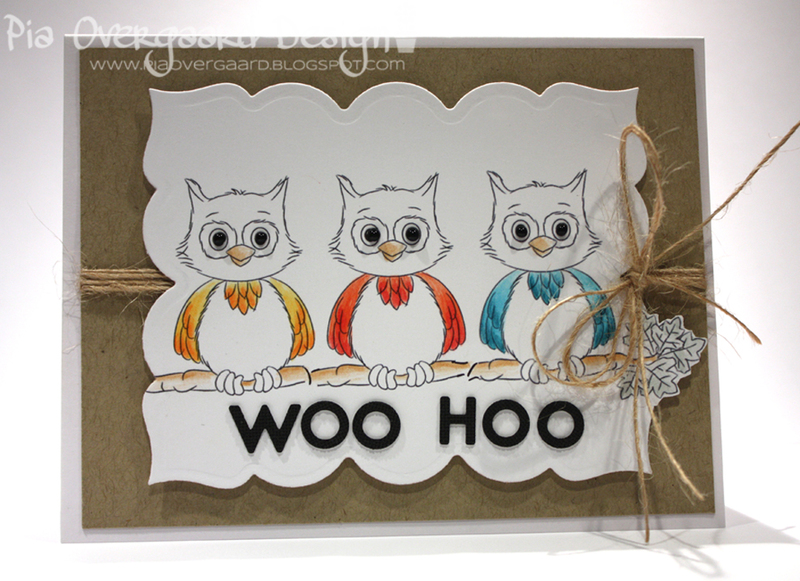 Love how you used colour on this card Pia and those owls are so cute, they made me smile! Oh Pia, I really love this sweet design. Lining up 3 of those cute owls and using the different colors is so brilliant! Tak for en hyggelig weekend. Det var dejligt at se dig igen.